Vinyl records are having a renaissance. The oldies are indeed the goodies and in demand by collectors. Some albums are hard to come by, but the owners of these stores have made it their business to find even the most elusive. From vintage jazz records to your favorite modern pop albums, find all the best at these great record stores in New Mexico. There are 50,000 records, cassettes and CDs for sale at this shop, everything from soul to funk to hip hop, disco, reggae, blues folk, country, as well as soundtracks and classical groups. The record collection includes 45s and 33 1/3s. They can help with special requests for hard to find artists, too. Also on-hand is used stereo equipment, framed album cover art, LP bowls and protective accessories. Don’t leave without a peak at the bargain bin. You’ll find new, used and audiophile albums in good, clean condition. If you’re on the fence about an LP, you can listen to it before buying. The bulk of albums are 12-inch and run the gamut from blues to classic rock to classical. But country, folk, garage, indie, jazz, reggae and rock are well-represented. The owner buys and sells and provides appraisal services and turntable repair. The buzz about this store is that it’s a vinyl paradise for collectors. The sizable inventory is eclectic, with everything from used and new records, albums, vintage and obscure artists and CDs, 45s and cassette and eight-track tapes. Prices vary, but most albums are under $12. Buy, sell or trade. Music-themed t-shirts, stickers and posters on-hand. This shop bills itself as the largest independent record store in the state with inventory that covers new releases, new old stock and used seven and 12-inch records. It is jam-packed not only with records but with CDs, DVDs, cassette and eight-track tapes and picture discs. You can buy, sell or trade records or tapes in a variety of genre that includes rock, jazz, punk and country. Dollar records, vintage clothing, rock t-shirts, posters and used stereo equipment for sale, too. This mom-and-pop style record store is a vinyl junkie’s happy place. There’s a little something for everyone, plus an entire room filled with just 45s. If you like the art of the treasure hunt to fill the gaps in your collection, there are thousands of crates to sift through … you might just find that hard-to-find treasure. Merchandise includes new and used vinyl representing a myriad of genres, plus record players and hip band apparel. 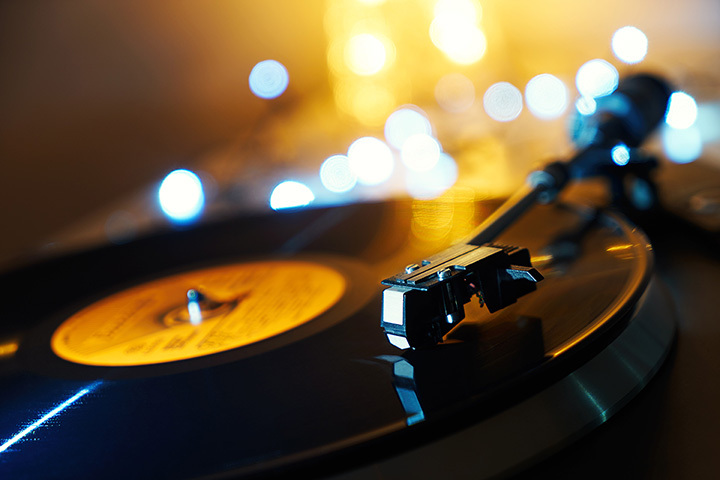 Vinyl records are making a comeback with new generations of music lovers who have discovered the real music sound found only on records. You can buy or trade LPs, CDs, DVDs and cassettes in good condition, or consign them. The owner, a music connoisseur, accepts all genres. What’s more, you’ll find turntables, home electronics, used instruments, musician supplies and art, clothing and jewelry. You’ll find a just a small portion of the 100,000-record inventory at the brick-and-mortar store located in a local antique shop, but it’s well-worth a stop. Part of the shop has LPs and 45s in a multitude of genre and various prices; the other part is full of LPs priced at only $3 each. If you can’t find that rare album, the owners most likely have it in their warehouse. Heavy on soul, funk, jazz, rockabilly, garage, psych and reggae, but inventory is constantly changing. This shop is off-the-beaten track—it’s in an auto repair store—but the man behind it is a true music lover who created a place to embrace this passion. It’s mainly a music store that sells acoustic, electric and bass guitars, plus ukuleles and mandolins. Additionally, customers stop by to peruse the wall of used vinyl albums, both standard size as well as 45s.